After 16 Group Stage games, everyone have had opportunities to analyse all the teams and have a first look at the tactics and starting XI of the teams. Before we make transfers for GW2, we take a look at the first 6 Groups (A-F). Unfortunately there is just a very short window between the end of GW1 to the close of the GW2 transfer window (1hr) so we advise you to make changes early! We run through the groups and make some generic picks for the World Cup Fantasy. Saudi Arabia looks to be by far the poorest team here in Russia and it’s time to jettison all the Saudi players in your squad. They look to struggle upfront and at the back, it will be a surprise if they manage any more than consolation goals. Mo Salah (FW | 8.5) was rested against Uruguay and will have to play a part in Egypt’s next two games. Still pricey at 8.5 in our opinion though we think he will get a goal or two. Uruguay were definitely off the mark in their opening game but Edison Cavani (FW | 9.5) looks like a solid pick against the Saudis in GW2 – a clear choice to start as captain too. Host Russia has done superbly well and we expect Denis Cheryshev (MF | 5.5) and Aleksandr Golovin (MF | 6.5) to be good fifth midfielders. 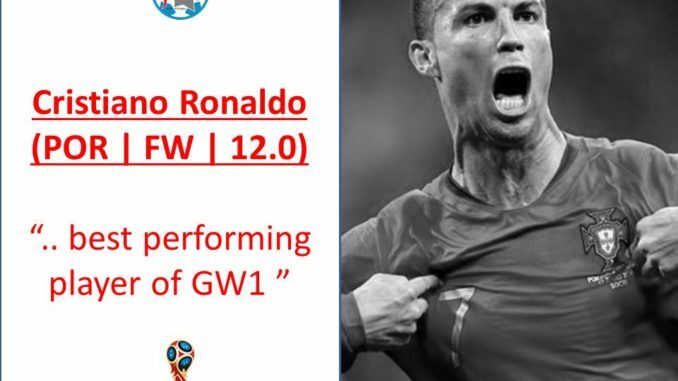 How dare anyone ignore Cristiano Ronaldo (FW | 12.0). At time of writing he is the best performing player of GW1 and looks odds on for the Golden Booth. If you do play your wildcard in GW2, it’s a chance to bring him in. Their opponents in GW2, Morocco gave a good account of themselves but do not appear to have enough to fend off the Portuguese. With Spain to come, it is no longer wise to hold on to any of the Moroccans. The same can be said of Iran, despite their opening win. Spain may have conceded three against Portugal but look to have firepower all round to progress. Top recommendations from Spain are Nancho (DF | 5.5), Diego Costa (FW| 9.0) and maybe Lucas Vazquez (FW | 6.0), who may get a few goals when he comes off the bench. Peru may have lost to the Danes but they look good going forward. They do play France next but Andre Carrillo (FW | 5.5) is a top budget forward to have. The Danes plays the Aussie next so Kasper Schmeichel (GK | 5.0), Simon Kjaer (DF | 6.0) and Pione Sisto (FW | 6.5) are worth a look in. 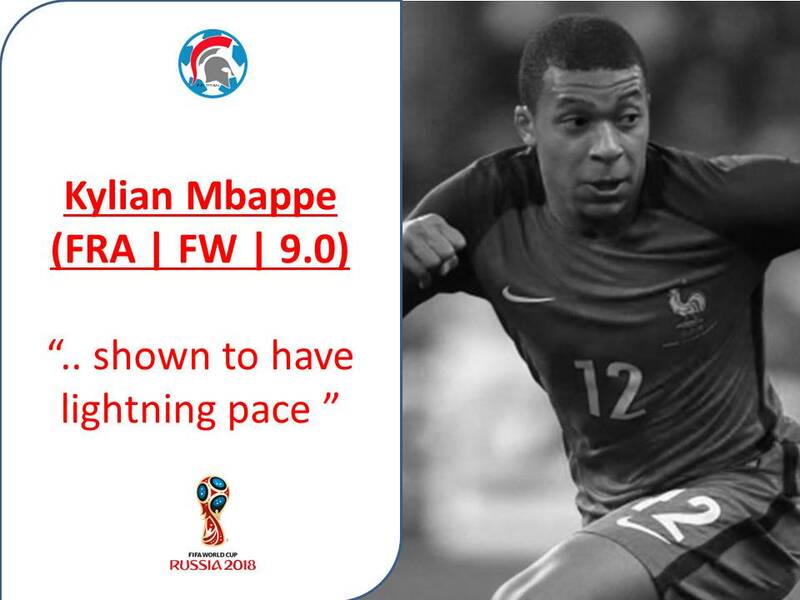 The French may have just scrapped through but they did get the three points and two players stand out for Fantasy – Benjamin Pavard (DF | 4.5) and Kylian Mbappe (FW | 9.0). If Pavard continues to play he will be a superb choice at his price and for Mbappe, he has shown to have lightning pace and will no doubt find the net in games to come. Nigeria look sluggish against Croatia and we are not so sure they will get anything against Iceland and Argentina. Croatia looks solid but generally their squad look overpriced. Dejan Lovren (DF | 5.0) is the best bet given his abilities to go forward. Argentina look set to make the changes in their games to come after a poor showing against Iceland. If you fancy a gamble, bring in Paulo Dybala (FW | 8.0) – a definite possible game-changer. For the majestic Iceland, we think Alfred Finnbogason (FW | 6.0) have a few more goals in him and Hannes Halldorsson (GK | 5.0) looks good. All round, the Swiss look very solid and will not ship goals easily. Yann Sommer (GK | 5.0), Manuel Akaji (DF | 4.5) and Fabian Schaer (DF | 5.5) are good choices. Serbia looks quality all round and we fancy Aleksandar Kolarov (DF | 5.5) to score at least one more thunderous free-kick. Sergej Milinkovic-Savic (MF | 7.0) can be a superstar from the tournament. Brazil should navigate past Costa Rica with ease and perhaps Roberto Firmino (FW | 8.5) may be started in the next game. Danilo (DF | 5.5) is as good a Brazilian defender as any other – and the cheapest. Germany now probably need to win their remaining two games, though changes may be rung. Marco Reus (FW | 8.0) had 30 mins against Mexico and may start the next game. Marvin Plattenhardt (DF | 5.0) may continue to deputise at left-back and makes an excellent choice at his price. How good is Mexico, eh?Hirving Lozano (FW | 8.0) looks like a superb pick and Miguel Layun (MF | 5.5) is a listed midfielder playing very much up front. Sweden may have beaten South Korea but neither sides impressed. We now know Andreas Granqvist (DF | 5.0) takes penalties so looks like a good pick. Ola Toivonen (FW | 7.0) is a cheap striker that plays.